Our first Throwback Thursday post features a film project that we did with some truly deadly kids from the community of Wujal Wujal in Cape York. This was one of our first film projects. It was funded by Dot Com Mob and was created in collaboration with Sarah Scragg Productions the community of Wujal Wujal, and with the staff and students at Bloomfield River State School. This project was a really authentic learning project for the kids. 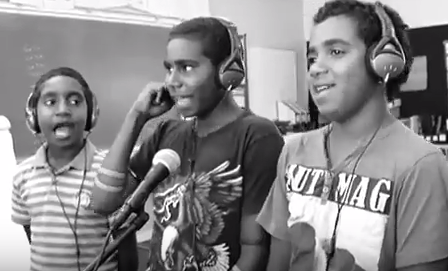 The kids created a rap song using a combination of English and Kuku Yalanji language. They learned how to create clay animation characters, and how to operate a range of professional film equipment. They rehearsed their song, and participated in an epic two days of filming. The end result of these workshops was a truly deadly film that lifts the spirit, and which is a testament to the strong and special people that make up the community of Wujal Wujal in Cape York. Most of these kids are either grown up, or on their way to becoming adults now (gee, doesn’t time fly). We hope that this Throwback Thursday post reaches these deadly kids, so they can enjoy their achievements one more time! Thanks to all those who participated in these film workshops. A special mention must be made to recognise the contribution of Indigenous educator, Norman Tayley, and to the staff at the school and the community members who spoke on camera. Please enjoy our first Throwback Thursday feature!